I recall reading many narratives when I was young where the wanderer boarded a tramp steamer, heading off to adventures unknown. I would always picture a rusty steel hulk with a shady captain and crew trafficking in illicit goods. When not so suspicious, I’d imagine a still-rusty, generally shabby boat that travelled not so much a set route but instead where the cargo and weather dictated. All that is to say, I didn’t ship on a tramp steamer, though the Eden is definitely not a cruise ship. 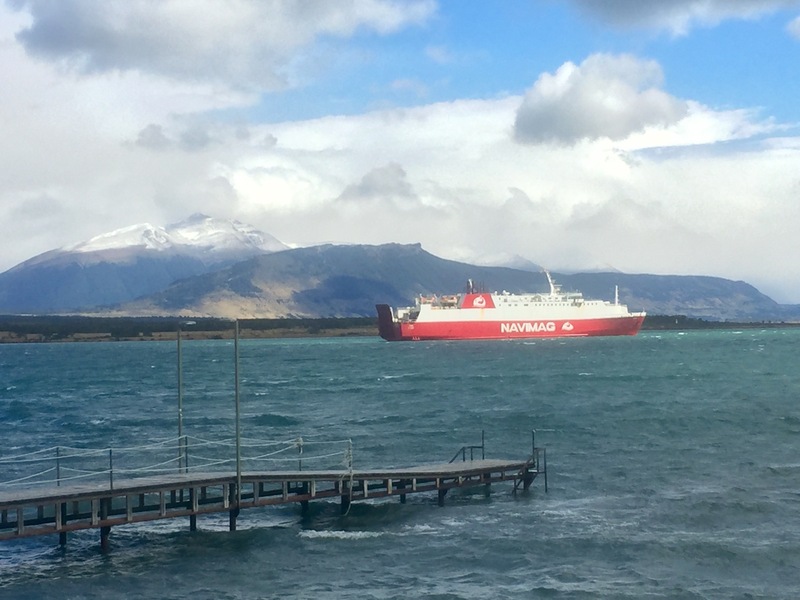 On a line up through the inland canals of the coast of Chile from Puerto Natales to Puerto Montt (with a glancing stop at Puerto Eden) run a pair of 1980s ferry boats, hauling mainly cargo in the form of trucking trailers along with a few cars. The Eden has a series of cabins, a shabby lounge, a cafeteria, no internet (!) and therefore transports passengers who are generally not in a hurry to move from the south to the closer-to-the-north, nor overly concerned with luxury. The appeal is a peaceful cruise through an unpeopled land framed by glaciered mountains with waters populated by albatross and the occasional whale. We boarded late the night before, most people traveling in pairs sharing cabins with windows, but some of us in the equivalent of steerage, ending up in closed bunk rooms with random roommates. They are actually comfortable, feeling much like a hostel room, and Jens, my roommate, is a nice man from Germany. Most of the ship’s announcements are in Spanish and English, but at least on this trip, they should include German as that seems the dominate group. Not luxurious, but not a tramp steamer either. El Niño is the controlling weather pattern here, so days are dominated by drizzle with occasional breaks of bright sun which inevitably produce rainbows. The passengers all seem to have a certain sense of adventure which manifests differently depending on nationality. There are the two couples from Australia I had seen at a coffee shop back in Natales (I had watched closely their response as the stereo in the shop cranked up “Take a Walk on the Wild Side), a kiwi long distance cyclist who wears shorts and flip flops while the rest shiver in multiple layers, a German man wanders with a horn about his neck, blowing it at random moments outside. There is a geomorphology professor from Humbolt University in Berlin with a host of students on their way to study the volcanos of the lake region. Four are in a room across my hall, charming and interesting people. But my favorites are an Italian couple from Genoa who generally keep to themselves. The woman’s excitement is palpable. She looks out the window from the lounge with a huge smile and often jumps up, gathers her camera and ducks out on deck to snap pictures, returning with an even bigger smile and a quick caress for her husband. There seems to be only one other American, an older woman who talks without interruption. Some poor Australians got caught and stood listening politely for long minutes, just like Coleridge’s wedding guest when buttonholed by the ancient mariner. 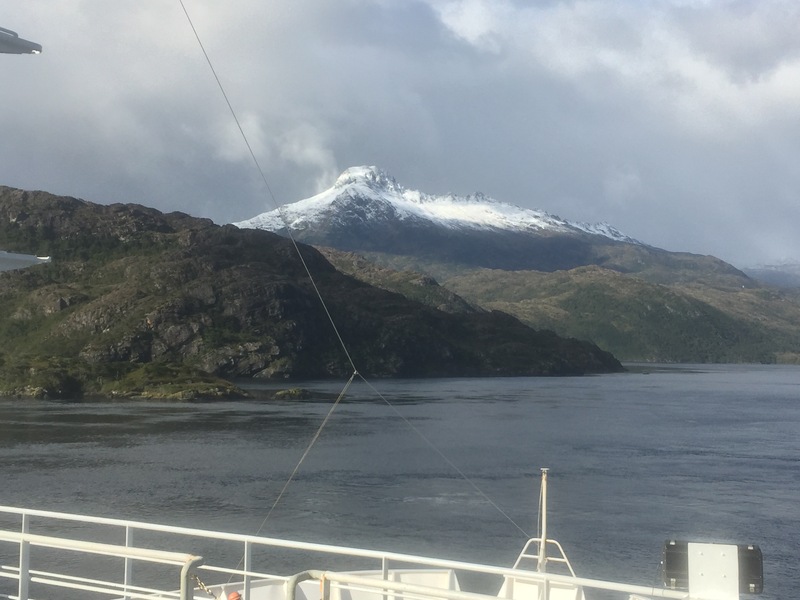 The crew do their work on other decks, though there are several assigned to the passengers, including a multilingual polymath who delivers daily lectures (in both English and Spanish) on geology, flora, and fauna—he is knowledgeable but more to the point, enthusiastic. The first day of cruising was calm and uneventful. Some dolphins danced off the bow, and parts of the day revealed clear views of mountains with a dusting of new snow, but what was most compelling was the sheer emptiness of the area. We cruise through islands, large and small, that have no trace of human habitation. I remember stories of sealers (Melville and perhaps Dana) who would come into Chilean coves to kill and process seals, and imagine their visits here or perhaps canoes or small boats of the Tehuelche moving from island to island, but clearly this is a place to pass through and not to linger long. The winds blow often with gale force, and the land is steepsided, with sheer cliffs coming straight to the waterline, and everywhere, on high, spout waterfalls fed by the distant glaciers.